What should doctors know before joining a startup? I don’t know if these were questions medical school graduates in the Bay Area asked themselves as they opted to join a startup rather than completing their medical training in residency programs. These new doctors felt they could make a bigger impact on patient care by leaving the system and its current status quo. Khosla encouraged attendees to develop technology that would stop doctors from practicing like “voodoo doctors” and be more like scientists. Disruption required having an outsider point of view. Khosla highlighted how CEO Jack Dorsey of Square was able to disrupt and provide services more cheaply than the traditional methods of the electronic payment system accepting Visa and Mastercard because only 2 percent of the employees at Square ever worked in the industry. There is the lingering perception that technology can make health care cheaper, more accessible, and better without physician insights. Yet there have been few public successes so far. In an interview with Malcolm Gladwell, venture capitalist Bill Gurley seemed resigned to the fact that finding such a startup to fix healthcare will not happen. Yet, I believe there are opportunities for startups to help. For healthcare to be disrupted, doctors and Silicon Valley need to collaborate. Each group brings valid and important points of view that the other cannot fully understand simply because you don’t know what you don’t know. For doctors joining a startup, add tremendous value by understanding the challenges the healthcare system faces as well as the challenges and mindset of a startup. Here are five recommended books to get you started. You hear how startups will disrupt the status quo. Who came up with this? Harvard Business School Professor Clay Christensen has often been credited with the concept of a disruptive innovation. A disruptive innovation is a product or service that not very good initially. It serves a market or need that is currently ignored by incumbents. Over time the disruptive innovation gets so much better that it serves larger markets or needs that it overtakes the incumbent companies. At this point it is too late for the incumbents to respond. An example of such an disruptive innovation might be Apple’s iPhone where much of the initial functionality has now become so robust that incumbents creating digital camera, GPS, camcorders, or laptop computers are in trouble. 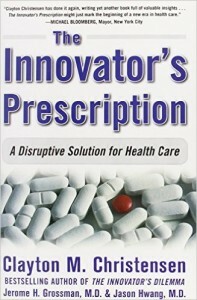 Christensen’s book, The Innovator’s Prescription: A Disruptive Solution for Health Care, is the best book on how disruption in health care might occur. By looking at other industries where initially products and services offered were “so complicated and expensive that only people with a lot of money can afford them, and only people with a lot of expertise can provide or use them” and how over time everyone now had access to telephones, computers, and airline travel, the book provides a framework on how that will happen in health care. Anyone wanting to succeed in the new world of health care as predicted by this comprehensive and thoughtful analysis would be wise to add this book to their list of must reads. Written by entrepreneurs, Peter Thiel and Ben Horowitz respectively, these books provide an insider’s perspective on both the promise and perils of being in a startup. Venture capitalist Peter Thiel was the co-founder and CEO of PayPal and founder of Planitir. Thiel believes technology can solve our problems and the importance of using the strengths of technology and people to make an impact.Zero to One: Notes on Startups, or How to Build the Future notes there is only one moment in time when something is invented and you go from zero to one. The creation of Google was such a moment. If Thiel’s book captures the optimism of a better future, Horowitz’s book details the gritty realities of a startup CEO in The Hard Thing About Hard Things: Building a Business When There Are No Easy Answers. Venture capitalist Horowitz was CEO of Opsware. He pivoted the business multiple times when things looked bleak, found capital during the worst economic crisis since the Great Depression when everyone thought he was insane, and led the company through multiple layoffs before successfully being sold. A sobering yet incredibly important read, Horowitz shatters the allure, mystic, and promise of startups and replaces it with the stark frankness that the world is competitive and startups are fragile and the path to success difficult. Understanding the current healthcare status quo is important if one is to understand the variation in medical care and outcomes. Overtreated: Why Too Much Medicine Is Making Us Sicker and Poorer is the best book to quickly get you up to speed on why we are the most expensive in the world and the worst at keeping us healthy. Balanced and thoroughly researched, this book illustrates how the failings of our healthcare system are more complex than simply claiming that insurers are greedy and malpractice insurance premiums are too expensive. Learn what you are up against if you plan on disrupting healthcare. Doctors don’t work well in teams. This was outlined by New Yorker writer, best-selling author, and surgeon Dr. Atul Gawande in Cowboys and Pit Crews. Yet it is teamwork across disciplines that matter in a startup. Here is where Harvard Business School Professor Amy Edmonson’s Teaming: How Organizations Learn, Innovate, and Compete in the Knowledge Economy is helpful. To maximize learning, conflict and failure are necessary for teaming to be successful. Successful teaming requires an environment where it is psychologically safe to speak up, which is not typically true in a hospital environment where a strict hierarchy still pervades. Edmonson highlights how individual and organizational psychology, the reality of hierarchical status, cultural differences, and distance can and do separate team members which can prevent successful teaming. Leaders can close these gaps by understanding the existence of these obstacles and by adapting their leadership style to support and facilitate teaming successfully. She gives plenty of examples where teaming went well and not so well (the “impossible” rescue of miners in Chile and space shuttle Columbia tragedy). Learning thoughtfully from these failures and framing them as essential for continuous improvement and innovation is key for organizations to benefit from teaming. So by understanding these dynamics, you can determine whether your startup has the dynamics it needs to be successful and how to lead one. There you have it. Five books. Five perspectives. Good luck! I can’t wait to hear what you come up with! Can Community Organizing and The “third place” Improve Public Health?